The ladies from The Cleaning Authority are here working. I’ve been up since 7:00, journaling and then working to find the maximum amount of horizontal surface area so they could actually do their work. And now, it’s past time for me to head to my job, yet I am compelled to complete a daily blog post. So, here goes. 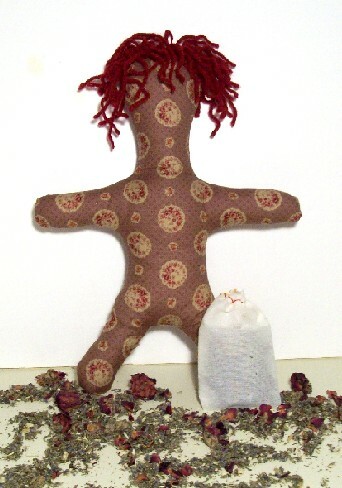 Several years ago, I was reading about making dream pillows with calming herbs and thought that a washable doll with a secure pocket for changeable herb packets would be a great thing. The pocket is doubled back so that small fingers cannot remove it, but an adult can easily remove it in order to toss the dolly into the washer. I sewed up a few to sell on e-bay and then realized that while I really enjoyed designing it, and liked sewing specific items for specific people, I really did not like production sewing. So, now I have a bin filled with patterns, assorted fabrics, yarns, herbs, and a few dollies that I may one day return to when I have a notion to do some sewing, crafty stuff. And I have also fulfilled the Blogging Imperative for today.